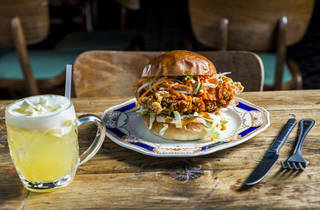 Permanent fried chicken and cocktail restaurant from serial pop-up enthusiast Carl Clarke. Fish ‘n’ chips, rock ‘n’ roll and, er, Ant ‘n’ Dec. There’s just a handful of twosomes so meant to be that they share but an ‘n’ between them. if the popularity of Chick ‘n’ Sours is anything to go by, it should probably be fast-tracked to this hall of fame. Lights are set low – just a touch of blue neon – and music up high as diners and takeout customers file in. 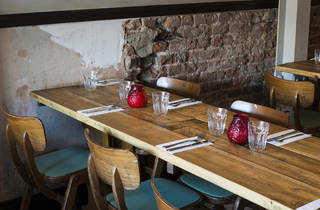 It’s unsurprising that the atmosphere is set to ‘party’ on a school night, since the man behind the fowl play is Carl Clarke, the chef behind Disco Bistro among other pop-ups. He’s practiced his chops pairing good times with good food, and posters from his former pop-ups pepper the walls. If KFC (Korean fried chicken) ain’t your bag, the house fry or chicken tenders can be paired with potent dips (£1.50 each). The St Agur and buttermilk may prove too rich for a chicken dinner, but bone marrow barbecue sauce is an ideal accompaniment, sweet and extra syrupy. We chose to stick with Asian flavours. 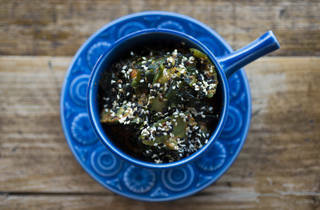 The guest fry (£11) in a warming satay-style sauce pairs excellently with a side of smacked cucumber with wakame (£4). And what about those sours? Put it this way: I’d seek this place out for the bar alone, which does simple but satisfying things with its cocktails (especially when they’re just £6 each). They perfectly cut through those rich dishes, particularly the Paloma Sour with grapefruit for an extra bitter twist. 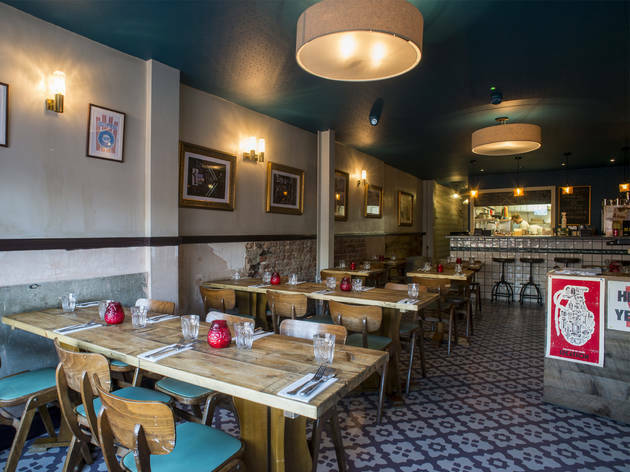 Those drinks, that music and the low, low lights create plenty of fun, especially when you’re crammed in tightly with neighbouring diners at tables spanning the width of the room. This cosiness may be a drawback for some, but we liked the buzz. Who knows? When you visit, you may even get clucky. Dalston Junction or Haggerston Overground. Open Tues-Thurs 6pm-11pm; Fri 6pm-12.30am; Sat 11am-12.30am; Sun 11am-10.30pm. I was expecting a lot from here (read all glowing reports below) however, for me, it was nice but it wasn't out of this world delicious (*ducks for cover*). I had The Colonal with a side of chips and Kewpie mayo. The chicken, while pretty tasty, was just way too fried for me; it felt/tasted like I was just biting mainly into batter. The chips were nice but what I did love was the sauce on the burger and the burger buns - absolutely delicious. Aside from the food, the vibe is as awesome as the staff who were all super friendly and attentive. I didn't get a chance to sample the 'sours' element of 'Chick 'n' Sours' so I need to rectify this as soon as possible! Although I wasn't blown away, I'm definitely going back again to try some more things because I really want to like this place as much as everyone else does! 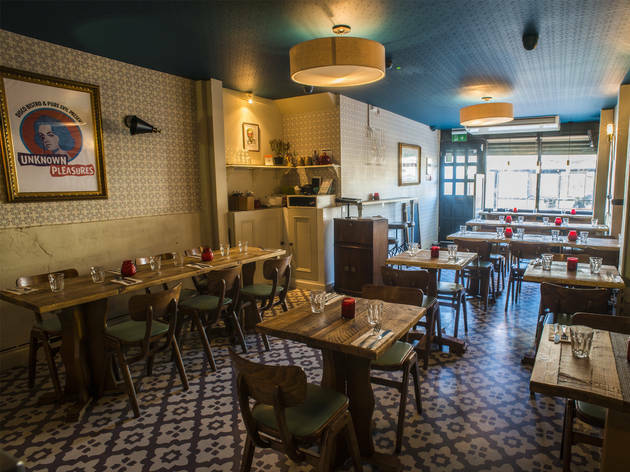 Okay, so the food is great – really, genuinely lovely, flavoursome fried chicken and wonderfully inventive sides. Top cocktails, too. My only complaint – and not one I make often – is that the portions are simply too huge, meaning that on the two occasions I've been my prevailing memory has been of gastric discomfort. My tip would be to share what they recommend for two between three – it'll work out a bit cheaper and you won't leave feeling like you've just been impregnated by the Colonel. That was an epic chicken burger, with the amazing Korean fusion to really crank it to 11. The burger is huge and tall and a bit hard to take a non-messy bite. The only downside is the lunch service is a bit slow so if you are trying to get back to work on time, it will be a bit stressful. Great atmosphere, banging tunes and finger licking chicken! The best food and the best staff. Unpretentious, what more could you ask for! Love the seaweed crack seasoning. Good god the Korean fried chicken burger! Big claim but I can easily say this is the best burger I've had in London. Absolutely massive, perfectly cooked and just overall delicious. There's a great selection of sauces and sides (even the salads had bacon in so you can't go wrong). Definitely not a light choice or one for the health conscious, but really very good. The amount of times I've seen Chick'N'Sours on my instagram and left me drooling in desperation is well...countless. Even more jaw dropping has been their Sunday fry where well, they fry a chicken. As in, a WHOLE chicken. Yes, that is right. A WHOLE CHICKEN. I finally made it after coming in with a reservation (though really wasn't needed) and absolutely loved it. Definitely some of the BEST fried chicken in London, and was amazing how moist and tender every part of the chicken was, from breast to thigh and leg. We ordered it with the broccoli XO side which is in itself bloody brilliant, and fries which were good. The marrow BBQ dipping sauce was brilliant, though i think the blue cheese one would go best with the chicken. £25 for a whole chicken and 2 sides, and for £6 per cocktail, overall pretty good value given the chicken really is fantastic! Will definitely be back for their standard chicken tenders and the chicken burger which was HUGE! I wondered how good a chicken restaurant could be but I was pleasantly surprised! We went for a set menu option so we got to try lots of different dishes, including a Szechuan aubergine starter, sticky wings, boneless chicken and pieces of chicken. All was full of flavour, moist and delicious. The cocktails were great too and reasonably priced at £6 each. I'll definitely be back. Here I am, writing another fried chicken based review. East London (and I) can't seem to get enough of these birds, but Chick'n'Sours has somehow found a way to be original. We started with the Sticky Disco Wings. We thought, let's order a small portion to make room for our mains - 6 will definitely be enough, we don't need 8... but we were wrong. These disco wings were coated in sticky honey and tamarind sauce, and I could have eaten a bucket load. To follow on from our chicken starter, we ordered more chicken - one served in a bun, Korean fried with slaw and chilli vinegar, which was tip top - and the 'Guest Fry' (one of their changing specials) which consisted of the most tender of deep fried chicken thigh and drumstick, coated with a 'Kung Po' glaze, peanut and chilli. Dips wise, we were spoilt for choice, so we ordered both St.Agur & Buttermilk, and Sriracha & Sour Cream which perfectly complimented both dishes. 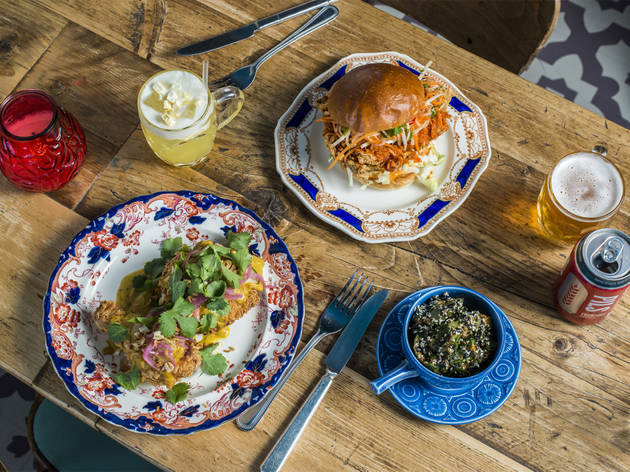 It's not just about the chicken here - sours is in the name, and they were also delectable, and they seem to give the whole fried chicken experience a hint of sophistication. 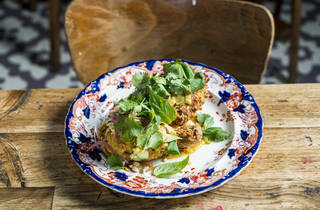 Go for the house sour, served with dried raspberries and chilli vinegar. All in all a bloody good evening. Tasty cocktails (sour is my favourite) that are good enough to have two and the korean bun is nice although you have to like vinegar. 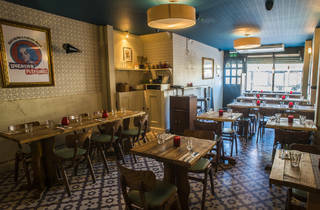 The place has a chilled purply vibe and attentive service. East London's best chicken restaurant! The menu is basic and consists only by what is the restaurant's name - chicken & sour! Try their massive chicken buns with the so-crispy-so-tasty chicken, the aubergine starters and their sour cocktails. On top - excellent prices & service. Love this restaurant! Best fried chicken I have ever tried. 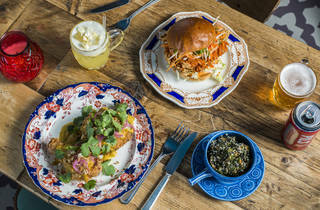 Best fried chicken in London - cool vibe, friendly staff and great drinks too. Next level amazing qulity fried chicken at last! Well spurced produce, rearrd chicken, cocktails and the side dishes to die for too! Seriously one of the best meals of the last year. Chicken was off the scale, drinks were superb, but the icing on the cake was the selection of dipping sauces - next level. Go there now. Incredible spin on Chick'n!! the drinks arent too shabby either.. Awesome. Just do yourself a favour and go! This place is addictive, can't stop thinking about my last house fry. Really is the best fried chicken in town. This little place is a must 'go to' for fried chicken, inspired flavours, cracking cocktails & awesome staff. Food and ambiance great - loved it all! Amazing food and great service - what a find! Never thought I'd like a fried chicken restaurant, but this place is next level. 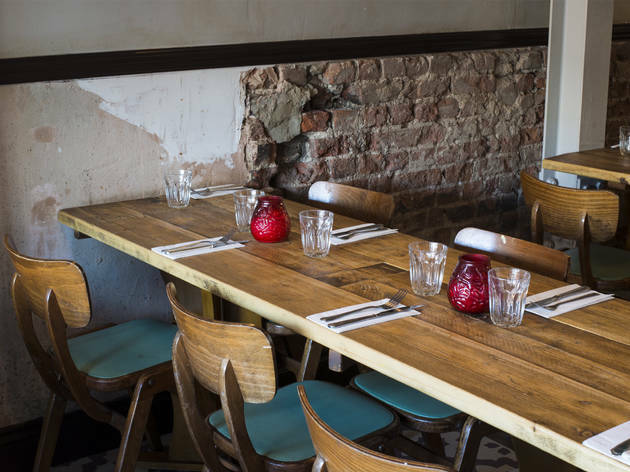 It's a small restaurant that plays pretty loud music, so it's not the ideal place for a chat or a first date, but it's perfect for a night out with your mates. The Mango sour is dangerously moreish. 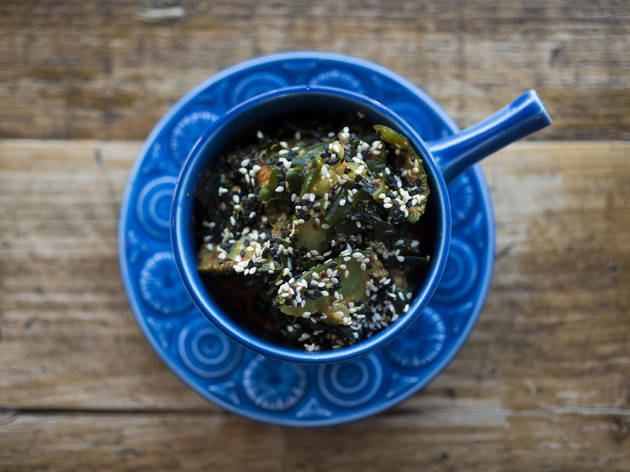 Try the aubergine dish - it's out of this world. And beware of the large portion sizes; it's easy to get carried away and order too much. Sharing is the best approach here. OK I’m a foodie but I have a soft spot for KFC. I’ll admit it. So when somewhere does deep fried chicken, LFM is there! 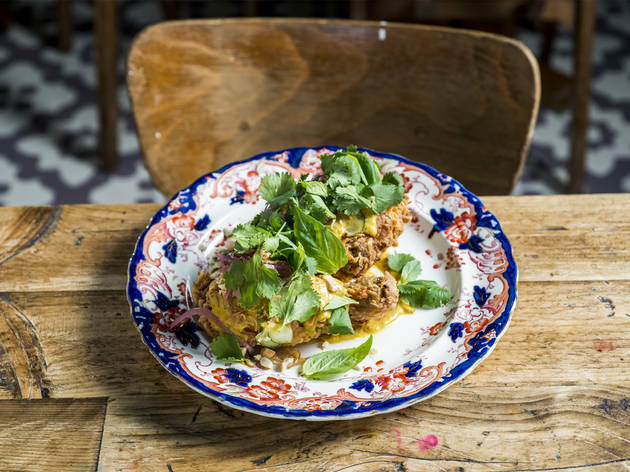 So we find ourselves in hipster-ville Haggerston where Chicks n Sour have recently opened. 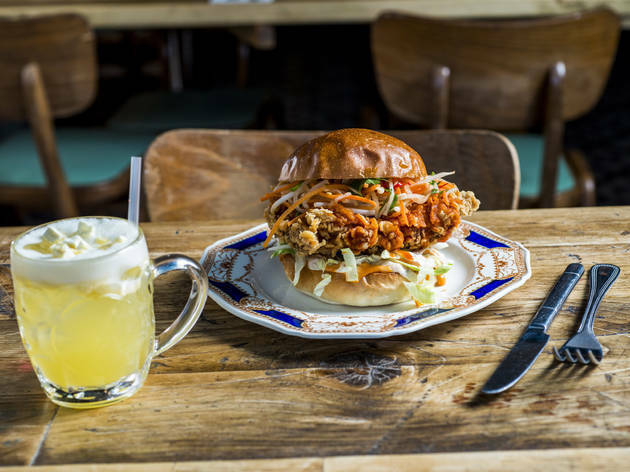 Most of the dishes are based upon deep fried chicken, priced around £10 for 2 pieces – expensive compared to the KFC benchmark but oh so worth it! Crisp and tasty batter, succulent chicken and interesting accompaniments like pickled watermelon. The soft whippy ice-cream desert was a bit of a let down compared to the mains. I'd heard about the delicious fried chicken sandwich through friends and had to go try it for myself. We showed up without a reservation and the restaurant was packed but the staff were really friendly and managed to find us a spot. The Korean fried chicken bun was as enormous and as delicious as I had been told, the chicken was really tender and it had just the right amount of spice. The drinks menu is impressive and the atmosphere is relaxed, I'll definitely be going back to work my way through the menu. It's a shame there aren't currently any pictures here, as then I'd be able to say "Yes, the chicken sandwich really DOES look like that". It's a beast and worth visiting for by itself, I can't really comment on too much of the menu as I was pretty incapable of eating anything else following the sandwich. 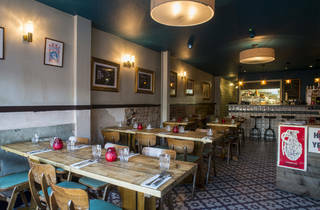 Service was good - staff tried their best to accomodate us on busy night and found us a good table that didn't feel like we were being squeezed in. Cannot believe no one has reviewed this little gem yet - this place is Fried Chicken AWESOMENESS...a simple menu of what has to be the best korean style fried chicken in east london served with beef dripping chips *dribble* and interesting salads. Their cocktails are pretty good to. Chick it. What can go wrong going to a sophisticated chicken shop?! Definitely nothing with the food! I finally managed to visit after watching a shoe and although I'd booked a table, I didn't really need to. We ordered the General and the K-pop which were both succulent and finger-licking-good! We also ordered some chicken strips which were covered in an Asiany tangy/sweet sauce. The watermelon salad that we ordered as a side was a little to heavy with the fish sauce and we didn't enjoy as much as the other food. The portion sizes are huge and the burgers needed to be deconstructed to be eaten unless you want to risk being covered in sauces/cheese or anything else that's been stuffed in the burgers! The service was quite slow, with other tables who had ordered after us receiving their food first. However, the staff discounted the bill so it was acknowledged. All in all, I'd go back as the chicken is delicious but the hygiene needs to be improved.